June 25, 2016 - "A Literary Bromance, Now in Its Sixth Decade"
"The partnership between Mr. Ferlinghetti and Mr. Lord, two towering legends in the publishing world, traces back to the heady, early days of the Beat movement, when a literary and cultural revolution was ignited by a band of iconoclastic writers. "Though neither of them can recall precisely when they first met, their long association dates from the 1950s, when they became acquainted through Jack Kerouac, one of Mr. Lord's first clients. Over the years, as many of the writers they knew have died, they’ve formed even more of a kinship. "'Sterling really is my generation,' said Mr. Ferlinghetti, who was born in Bronxville, N.Y., in 1919. 'We’re in the same boat, heading for the falls.'" "Mr. Lord, who was born in Burlington, Iowa, in 1920, likes to point out their age difference. "'Lawrence is the only client I have who is older than I am,' said Mr. Lord, who will turn 96 in September. "Now, they stand as two of the last living links to the Beat Generation. From opposite coasts, they fueled a literary movement that defined the era and ushered in a new populist, countercultural strain of poetry and fiction." March 3, 2015 - "At 95, Lawrence Ferlinghetti Recounts More Than Six Decades of Life in San Francisco"
"The first time I met Lawrence Ferlinghetti was unforgettable: It was early on the morning of Sept. 11, 2001, and Elizabeth Farnsworth and I were working on a story about him for the PBS NewsHour. "As surreal news trickled in of planes crashing in New York, Virginia and Pennsylvania, the crew and I continued to set up the lights and cameras while Ferlinghetti floated in and out of the room, offering stoic yet witty commentary. "Shortly after that morning, he composed "History of the Airplane," a prose piece inspired by the attacks. "So, when KQED conceived of its Boomtown series, which seeks to put the Bay Area's current boom-and-bust cycle in context, I thought who better to turn to than Lawrence Ferlinghetti, to reflect on the changes that gentrification and technology have made in his beloved city." A Motorcycle Diaries for a new generation, this long-awaited volume provides a panoramic portrait of art and life across the twentieth century. Lawrence Ferlinghetti—legendary poet and best-selling author of Coney Island of the Mind—collects here his six-decade-spanning travel journals. Beginning in 1950 and dramatically traversing the latter half of the twentieth century to the present, Writing Across the Landscape positions Ferlinghetti not only as a seminal poet but also as a major and unique American voice whose heretofore personal writings are now added to the fabric of twentieth-century literary history. Illustrated throughout with facsimile manuscripts and personal sketches, the volume gives glimpses of figures like Jack Kerouac in the '50s, William Burroughs in London, Ezra Pound in Italy, and a young Fidel Castro in Cuba at the dawn of the Revolution. Readers will journey to Mexico, Morocco, Paris, and Rome, as well as to post-Stalinist Russia on a harrowing journey on the Trans-Siberian Express. Embedded with new poems and Ferlinghetti’s pyrotechnic prose, Writing Across the Landscape evokes the people, places, and political movements that have shaped our time. From May 20th to June 17th, 2013 the National Archaeological Museum of Naples hosted, "Lawrence Ferlinghetti al Mann", the famous American poet, painter and activist of the Beat Generation. "On the Route of Ulysses," an exhibit of works by Ferlinghetti, recounts the journey of Ulysses in an ironic and irreverent way. The verses of Homer become the background of the ink drawings made ​​in 2010 during a trip in southern Italy, while the power of the colours and material consistency characterize works subsequently realized in San Francisco. San Francisco, CA, October 10, 2012—In September 2012 it was announced in Budapest that Lawrence Ferlinghetti, poet and founder of City Lights Books in San Francisco, had been chosen as a recipient of the Pannonius Prize. The prize, funded by the Hungarian government and the Hungarian chapter of PEN International, grants an award of 50,000 euros, and Ferlinghetti was to be its first recipient. While honored to be chosen and recognized, Lawrence Ferlinghetti has been a resolute supporter of freedom of expression his entire life. Given that the Hungarian government is widely accused of officially and unofficially stifling free speech and civil liberties, Ferlinghetti has decided to decline the award. San Francisco, CA, October 10, 2012 ― The MFA in Writing Program at the University of San Francisco announces the Lawrence Ferlinghetti Poetry Fellowship. This fellowship honors a San Francisco writer who, in his long career as poet, activist, and co-founder of City Lights Booksellers & Publishers, published and supported the work of writers who were outsiders— outside traditional academia or traditional social conventions. In 1956, after he published Allen Ginsberg's Howl & Other Poems, Ferlinghetti was tried and acquitted on obscenity charges in a landmark First Amendment case. MFA poetry professor D. A. Powell noted that "the Howl trial changed the culture of American poetry overnight and paved the way for a more open, expansive poetics—for poetry that confronted American hypocrisies and political institutions, willing to put its proverbial heart on the line." According to Catherine Brady, academic director of the MFA program, "When Ferlinghetti founded City Lights Pocket Poets' Series, paperbacks cost only a quarter and weren't considered a serious literary venue. It was Ferlinghetti's genius to see this as an opportunity for enacting a more inclusive and truly democratic vision of poetry. In his paperback publications, he gave many readers their first experience of poets such as Allen Ginsberg, Diane Di Prima, Denise Levertov, and Robert Duncan. As a poet and as a staunch defender of free speech, Ferlinghettti exemplifies the humanistic ideals of the university, which is committed to cultivating a strong sense of responsibility for the collective good." 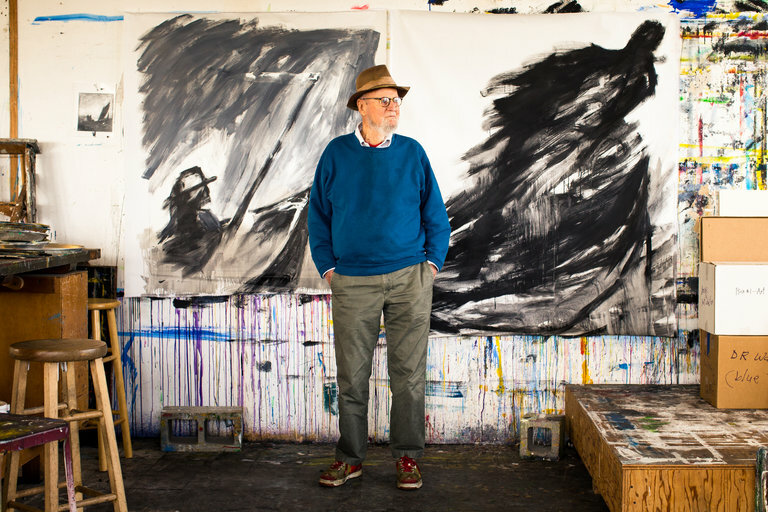 The Lawrence Ferlinghetti Poetry Fellowship provides full tuition funding and is awarded bi- annually to an applicant in poetry whose work embodies a concern for social justice and freedom of expression, interpreted in the broadest possible way. Applicants are encouraged to visit the USF MFA program website for more information. June 23 - September 23 2012, the Sonoma Valley Museum of Art honors the creative life of Lawrence Ferlinghetti with the exhibition Cross-Pollination: The Art of Lawrence Ferlinghetti. Lawrence Ferlinghetti's work, in both literature and art, is a drive for liberation, transformation, and union—through love, literature, political struggle, nature, humor, art. The exhibition focused on key themes that have occupied the artist and poet throughout his creative life, in both word and image. The San Francisco Art Institute (SFAI), one of the nation's oldest and most prestigious contemporary art colleges, is proud to honor famed art critic Roberta Smith; Bay Area poet, painter, activist and publisher Lawrence Ferlinghetti; and long-time SFAI Trustee Beverly James at the Institute's 134th Commencement Ceremony on Saturday, May 12th. All three are being recognized for their outstanding achievements in shaping contemporary art, culture, and discourse—for driving public awareness of emerging issues and ideas in the visual arts. Smith will be the recipient of an Honorary Doctorate of Fine Arts, Ferlinghetti the Douglas MacAgy Distinguished Achievement Award, and James a special distinction for her many years as an SFAI Trustee, Trustee Emeritus, and Chair of the Board. At the ceremony, Smith and Ferlinghetti will celebrate the graduating class of 2012 by sharing their reflections. The Poets' Plaza will be an oasis for San Franciscans and a national site for poets, a kind of national poetry forum, with a permanent poets' podium built into one corner of the square. There will also be chess tables, stone benches, and olive trees. And quotations from some 40 great poets from around the world will be incised in the paving of the Plaza. Inspired by the lovely piazzas of Italy, the Poets Plaza will be free of all traffic, an essential link between the neighborhood's major thoroughfares, Grant and Columbus Avenues, in the 600 block of Vallejo Street, between the landmark National Shrine of Saint Francis and Caffe Trieste, historic bohemian gathering place. The Poets Plaza is a civic project created by neighborhood volunteers, donations, and community grants. The Chinatown Community Development Center, North Beach Merchants Association, Telegraph Hill Dwellers, North Beach Citizens, and hundreds of local residents have already offered their qualified support of the project. The Mayor's office and the City planning Department are enthusiastic about the concept. In the second-storey windows of City Lights Books in North Beach, San Francisco, a passer-by can see what the founder, Lawrence Ferlinghetti, calls his "blog", in bold, painted letters on ruffled drawing paper, filling the glass. Statements such as "REWRITE THE LAW AND CORPORATIONS" and "MAKE TRAINS NOT TRUCKS" face a street of strip bars in this Italian neighbourhood. Drunkards and bakers, film-makers and prostitutes walk the streets around Jack Kerouac Alley, named after the infamous Beat poet who frequented City Lights Books for many years. "He's no revolutionary. Obama is a centrist." "Calvin White: One of the things Obama had done, he's captured the interest of the young. I was at a literary conference and they had one after another speaking praising speaker praising Obama, so I had to get up and say, 'Well, I'm from the Left Coast and we have a different view of Obama and, if you notice, the word revolution is never used by the Obama campaign, and in fact, no matter how many bad things the government does, the American people don't want to be disturbed in their pursuit of happiness. They're not going to have a revolution. Calvin White: So, there hope for the future? Lawrence Ferlinghetti: I don't know. It's pretty dim these days. Well, there's some hope with Obama. He's going to be a centrist and he might get some stuff done. Obama should try to rewrite the law on corporations. It really needs to be done. They have too much power over the people. Also, we need to have elections by popular vote; in other words, abolish the Electoral College. The Electoral College was set up by the founders of the United States to protect the interest of the landowning class... If you want true democracy, we need to have elections by popular vote. And it's possible that, if Obama gets two terms, some time in the second term, we might be able to change things like that. FDR was not at all radical when he first took office. He actually said to people who wanted radical change, 'Well, make me do it.' I hope that's what happens with Obama, that they'll make him do it. It depends on the youth to do it though. The whole new generation's got to do that." It has long been an idealist dream that someday society and life on earth would evolve in such a way that dissident writers and intellectuals would no longer have to be dissident. There are similarities between Obama and John Francis Kennedy, but they do not point to any real political or social revolution. JFK was not a revolutionary, and he would not have turned into one if he had lived. Obama too is no revolutionary, even if Abraham Lincoln is his role model. Unbridled capitalism has recently proved to lead to economic disaster, capitalist triumphs often being achieved at the expense of the poor. This leads to the conclusion that such a predatory system is an enemy of true democracy. We might very well have a Camelot Moment if Obama is elected, and we will certainly heave a huge sigh of relief to have someone in the not-so-White House who is an honest thinker and not a rogue President. But don't expect global corporate capitalism to be morphed into some kind of benevolent system in which the gulf between Haves and Have-nots no longer exists. There may be a Camelot Moment, but dissidents can only hope the new President will succeed in humanizing capitalism, if not taming it, and thus might that Camelot Moment become a Camelot Epoch. San Francisco Chronicle names the 50th Anniversary Edition of Lawrence Ferlinghetti's A Coney Island of the Mind one of the top 50 books of 2008! Lawrence Ferlinghetti and Shakespeare & Co.
"The world is a beautiful place / to be born into," writes Lawrence Ferlinghetti, author of "A Coney Island of the Mind," the witty, engaging, yet often disturbing little book of poems that now has been in print for 50 years. A famed and well-loved literary figure strolls streets and alleys of North Beach in San Francisco. Lawrence Ferlinghetti, 87, has pale blue eyes accented by a fringe of white hair. His tall, slender form is held erect with gentle, patrician dignity. If you didn't know this Beat poet and City Lights bookstore co-founder was a big star of the counterculture, you might think he has a military bearing. That the National Book Foundation saw fit to create a new award of Literarian at its annual prize-giving ceremony in New York this past November 16 is certainly a recognition that literacy itself is under attack in our electronic age and needs to be recognized and rewarded. "Literarian" sounds a bit Old School, and the word probably had its roots in some Ivy League or English cloister. A smart friend of mine told me, "It's for old guys." I hope not. Above all, it must be for the young. I come from a generation that assumed you would know the allusion when someone referred to Prufrock or Stephen Dedalus, Maud Gonne or Godot, Penelope's unraveling her weaving at night, or Dover Beach or Walden Pond, or lilacs that last in the dooryard bloomed. The absence of writers of color from this canon is shocking, but no one thought of that back then, in the last White century. Today, with the continuing dumbing down of America, literarians are definitely an endangered species, to the point that articles have to be written to define the term. It's not true President Bush believes that anyone caught reading a book should be banned from government. But the barbarians are certainly at the gates, and our dominant commercial culture welcomes them. This culture may globalize the world, devastating indigenous historic traditions, but it is not our mainstream culture. The true mainstream is made, not of oil, but of writers and readers, musicians and composers, editors and publishers, bookstores and libraries and universities, and all the institutions that support them. And this is the culture that will survive, if anything survives, after the electricity goes off and all electronic civilization fades away, when Nature strikes back in retaliation for what we're doing to it. Coming soon to your local theater, the Day After Tomorrow. There's much finger pointing as to who is most guilty in all this. Some say it's the omnivorous consumer culture. Some say it's the old military-industrial perplex. Some say it's the result of the predatory cabal of the military and the corporations. Of course, it's all of these, plus overpopulation, which is the root to which most major world problems can be traced. Take your choice. And then it would be quite helpful if you went out and did something about it. As Scoop Nisker used to say on his KSAN talk show, "If you don't like the news, go out and make some of your own." signalling to us our so-called manifest destinies?